memory aide:Â think of a telephone pole.Â It looks like a telephone pole with two horizontal bars and one veritical bar.Â The sound is the same “te” in telephone. Now, it is going to be a little more difficult to seperate it from mo, chi and ki.Â An obvious difference is that the vertical bar stops at the bottom horizontal bar and does not touch the top one.Â Unfortunately our memory aide works against this point.Â At this point, I can only point out this difference between them.Â Remeber the “te”lephone pole does not go to the top bar. 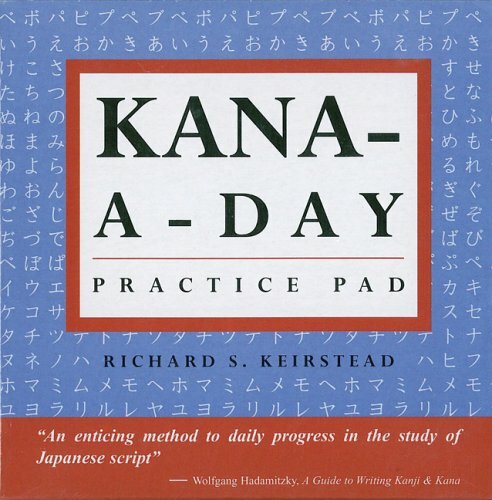 I have found the Kana-a-day practice pad extremly useful for learning to write, read, and remember the Hiragana and Katakana.Â Each day, it has a kana character, a place to practice it 24 times.Â Since I am going to Japan in July, though, I have been trying to do 7 of the pages a day.Â I definately recommend getting it. I have learned the Hiragana syllabollary.Â Now it is time to learn the Katakana.Â There is a one to one correspondence between the Katakana and Hiragana.Â So, this does not involve learning any new sounds.Â Hiragana is used for Japanese words, so it made sense to learn that first.Â Katakana is for foreign words and emphesis. There is a subtle difference in the slant of the bottom line and the shorter lines at the top.Â It is very easy to comfuse these. There are two characters that look almost like their Hiragana equivalent.